wow!!!! I died watching that! It's marvelous! ^^ good job here!! Awesome jacket! Do you have the reference photo? Yes, here you are [link] ! Thank you so much! 'cause, see, i'm trying to make a dress-up game and I want to make sure I get a lot of his best costumes! You're welcome! I wish that you will complete that game, I want to see them!! YES! I saw this jacket in the Lover of Life, Singer of Songs booklet and loved it! I like how you've balanced it out with Freddie's face - the jacket obviously pops, but it doesn't hog all the attention from Freddie himself (even though he's in black and white). Very nice. * and I have used the colors because I would o create this effect! But I have forgotten the microphone, damn! Thanks for all, you have understood my idea!! It's a pleasure to meet you! It didn't work out very well. 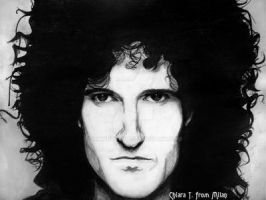 Even me when I have started to draw Freddie I wasn't so good, but with exercises and passion you will draw good, and I think that you will become so good than me! It's never perfect on your first try, and I'm an impatient procrastinator so I'll probably end up never trying again. I've never seen that costume before. I love the rainbow arrows. nice pop of color. it's groovy. 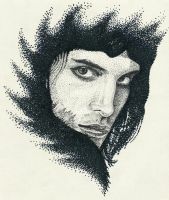 I drew freddie's fur coat from the killer queen vid once. ^_^ he had such awesome outfits. I saw your draws, they are amazing!! *-* good job!! this is the video freddie wears it in in, hopefully you can see it ok.
thank you! the third link was just a photo taken from the video it's ok if you missed it. All right!! you're welcome my dear! !